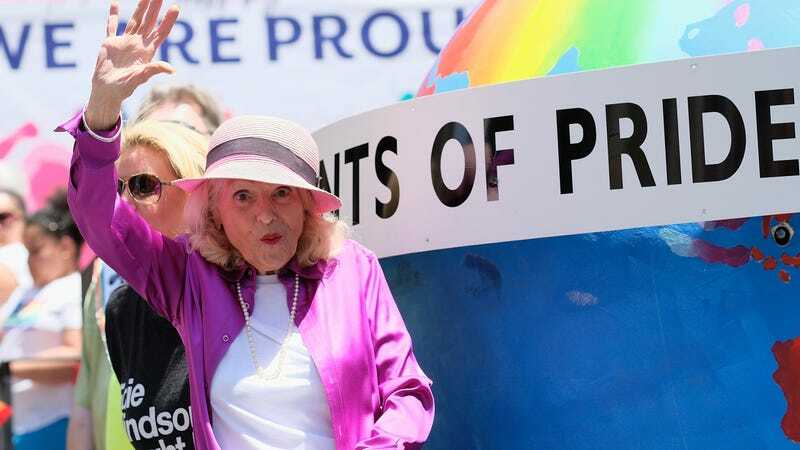 Edith Windsor, an activist whose landmark Supreme Court case is largely responsible for dismantling 1996's Defense of Marriage Act (DOMA) and making gay marriage legal in America, died on Tuesday at the age of 88. The New York Times reports that her death was confirmed by her wife, Judith Kasen-Windsor, whom she married in 2016, a few years after the death of her first wife Thea Spyer in 2009. It was during the aftermath of Spyer’s death that Windsor found herself thrust in the spotlight as an LGBT activist and marriage equality hero, as Windsor found herself with an enormous estate tax bill after receiving her inheritance. Spyer and Windsor were married in Canada in 2007, but their marriage was not recognized as legal in the United States because of DOMA. That meant that Windsor was not protected by an exemption on estate taxes for widowers. When her case made it to the Supreme Court in 2013, DOMA was declared unconstitutional, and the precedent set by that ruling was instrumental in the overall legalization of gay marriage two years later. “I had the privilege to speak with Edie a few days ago, and to tell her one more time what a difference she made to this country we love,” former President Obama said in a statement today. Windsor was born in Philadelphia in 1929. Edie, as she was known, met Spyer in 1963, following an unfulfilling marriage to the man who gave her her last name, and at the start of a successful career as a computer programmer. They began dating in 1965 and in 1967, Spyer proposed to Windsor. They were engaged for 40 long years until their eventual marriage, some 30 years after Spyer was diagnosed with multiple sclerosis. “If you have to outlive a great love, I can’t think of a better way to do it than being everybody’s hero,” Windsor told Ariel Levy in 2013. The film Edie & Thea: A Very Long Engagement, about their relationship, was released in 2009.